One fateful night, after a daring escape from her violent and estranged husband, Anne travels the world alone, undergoing a journey of self-discovery, deliverance, and destiny. Follow her story of triumph, wrapped in mysticism. Uncover her fate through the use of the Heartwild magic cards that guide her footsteps, and yours. How much the cards reveal about her future depends on you! 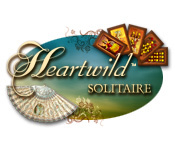 Heartwild Solitaire is rated 4.0 out of 5 by 27. Rated 5 out of 5 by upsysydaisy from Solitaire With A Story This was a very nice solitaire game. The story was romantic and written very well. I was anxious to get to the next chapter, like reading a little love story. The game ran smoothly, the music was nice and the boards were so beautiful. 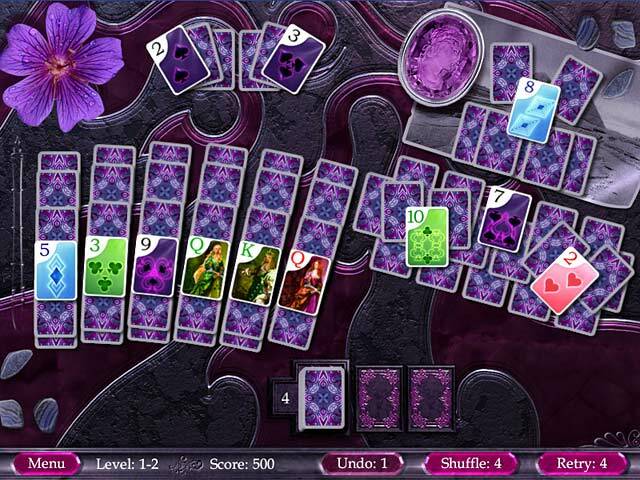 The colors and designs were stunning and are something not typically seen in a solitaire game. It added a new element of pleasure to the playing experience. There isn't much a game creator can do to make a solitaire game different enough to stand out from the rest. And the word "exciting" is never in the description. 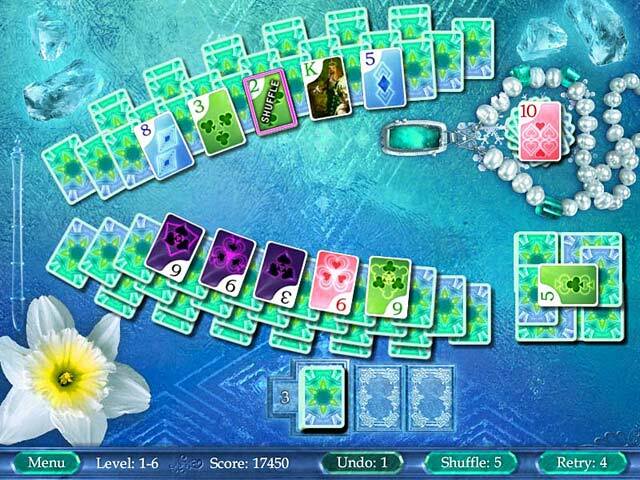 But I think this creator did a fine job of giving solitaire a new style. I found it interesting and attractive and I liked the score being kept for a goal to be reached which kept the game going for a long time. if you wanted it to. Rated 5 out of 5 by verimeri from great fun The story was at best so-so. The author could not seem to determine if poetry or short story. But the game was very fun and I loved it had two game plays. After finishing matched it also had 13's. Rated 5 out of 5 by ReneThePig from Fun Solitare game Heartwild Solitare is one of those games that I have sitting on my computer to while away a bit of time in between other stuff. It's a pleasant, relaxing, yet challenging game that I really enjoy. I've completed one run through the entire game and now am working on increasing my score. Great replay value to this game because you can compete against yourself over and over! The story was silly but once you go through it, it doesn't repeat in subsequent games, it gets right into the game play. Glad I picked this one up! Rated 5 out of 5 by SimplyLucy from A Treat For The Senses! Romance is in the air! 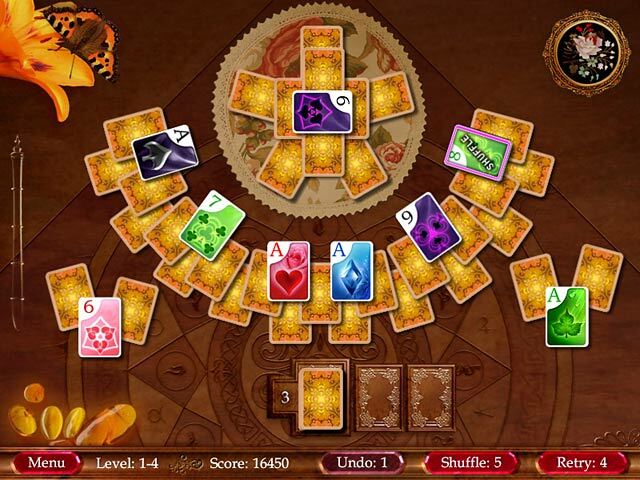 Solitaire played in a Victorian style setting with it's many intrigues intertwined in the storyline. A truly different solitaire game. Just relaxing and fun! Rated 5 out of 5 by bsnbsn from Speed Important This is not a standard solitaire game and it shouldn't be, It is a timed match game and a lot of fun, great music, and beautiful graphic color. Rated 5 out of 5 by fredandethel from Very attractive Mahjong-type Solitaire I didn't take any notice of the storyline but I love the game. It's actually 2 games: when you complete the find-the-same- cards game it opens another in which you match cards which add up to 13. Rated 5 out of 5 by cheryledz from LOVED this game! Relaxing! Give it a try. At first I wasn't wild about this game, then realized how relaxing it was - the music, no timers and a different kind of solitaire. It's matching the same number on the card. Hope this isn't a spoiler, but after you think you have finished the game, you get the opportunity to play another type of game. I won't say anymore. It is really enjoyable! Just give it a try, even if you get it on sale, it's really worth it. I will be going back to this one to play over quite a few times. Rated 5 out of 5 by nelliebj from What fun! If you like the Jewel Quest Solitaire games you'll like this one. Very similar to JQS I and II. Simple card matching but not always easy. And a couple of "challenge" games thrown in. All a good way to pass some time. Really nice graphics and the music is ok too (I don't usually turn the music on but this one was good and not too repetitive). Rated 5 out of 5 by BlackWaterRules from Fun Card Game This isn't the solitaire that I play. This is more like a fast paced "Match 2" with bonus rounds that move like lightning. It's like being in a casino with the music and the great graphics. There is a storyline behind it. It is just a few pages after each set of games regarding a woman who has left her abusive husband. I didn't pay any attention to it but if you are purchasing this game for a child you will want to demo it first. It was an immediate buy for me. Rated 5 out of 5 by DCHinFLA from A Different Kind of Solitaire This is more of a card matching game than a solitaire game, although it retains some basic features. But that's fine. The music, graphics, and interface are all fine. The only drawback is the storyline which is too spicy to hand-off to kids. Wish there was a way to disable it. Ultimately I could not stop playing this game, and I guess that's the bottom line. It was making me addicted. It's not Fairway Solitaire (which is the standard for solitaire variants), nor is it a just a card game with a cool deck, but this quick action card game really gets the job done!